To coincide with the Chinese new year for the year of the snake, the Diva challenged us to make a tile that was snake related. You can find the challenge described at challenge 106. Tangles used: Fescu, Mssst, Scrawls, Sedgeling, Verve, Zinger, and, up in the left-hand corner, my new tangle "Zoya". This one is dedicated to my six year old granddaughter who is always asking "Teach me another tangle Grammy." She loves to tangle in colour with all my fancy pens. 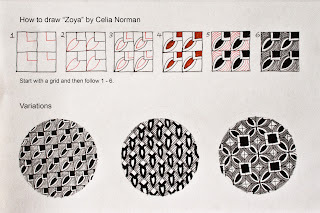 For how to draw "Zoya" see below. 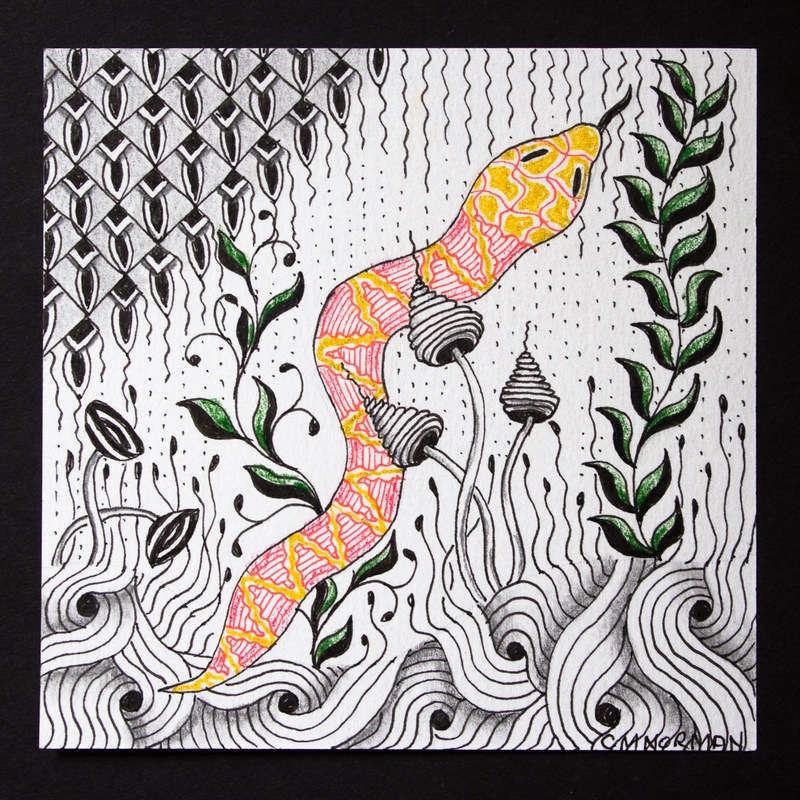 A lovely snake in a garden with well chosen tangles. I love the organic feel of this tile! It's beautiful; however, being averse to snakes, I believe I'll put in a different one of God's creatures, LOL. I do very much like how lovely it is, though. 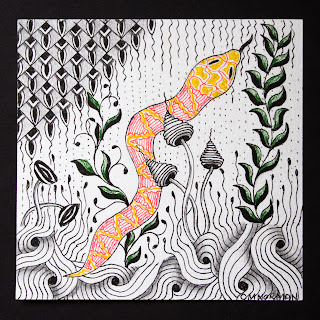 Hello: I just discovered Zentangles a short 2 months ago by absolute chance on a stamping blog and I was immediately hooked by this amazing art form. Your design is so beautiful and creative, you have and incredible gift and the kindness to share it with the world so Thank You so very much!!!!! Your snake tile is lovely! 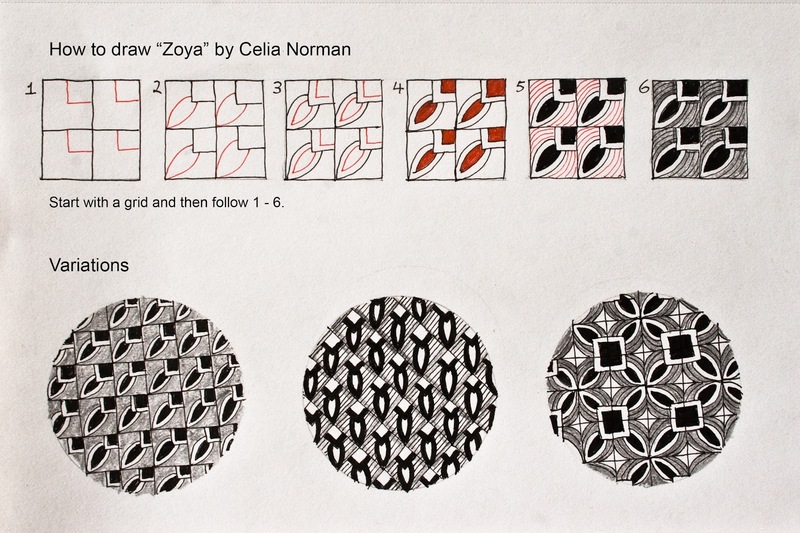 And Zoya has a lot of potential, a very nice pattern!! LOL, just when I had the first look at it, I said to myself "Oh, zo ja!" which is Dutch for "Oh, that way, yes!".... Thank you for sharing, Celia. Wonderfull, and variations are great surprise! Love It!!! A versatile and lovely tangle. I really like the variations. I look forward to using it. Thanks.